Every morning he gets out of bed and goes through the exact same steps to get ready for work. I’m talking down to a “T”. I could actually mimic his steps all the way through his morning routine until he even kisses me goodbye and locks the door behind him. I mean it is crazy you guys. It never changes. With that being said, I never want it to change and I always want to share a bathroom with him forever if possible please, thank you. HOWEVER…I want my own sink darnit, and I finally got it. He’s out!! He moved on to the “other side” and let me tell you…it is a relief. No more stubble. No more toothpaste glob in the same spot on the counter every day. No more leaving his drawer open 1/2 inch like clock work. Just NO MORE! Welcome to our “Master Bathroom Renovation Husband’s Shaving Station Sink”. This is a good one guys, get some popcorn. 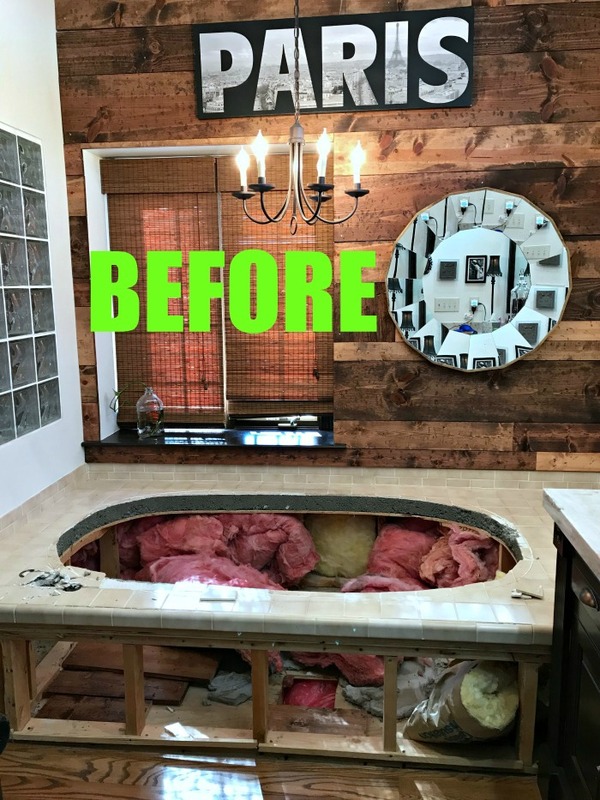 Before I get to this amazing shaving station sink reveal, if you’ve missed any of the “Master Bathroom Reveals” up to this point so far, you can start at the very beginning like a TV mini-series here—-> FOLLOW THE MASTER BATHROOM RENOVATION IN ORDER HERE. When we bought the house I tried to ignore the sharing a sink part. Oh, I know it’s not THAT BAD to share a sink with your significant other, oh but really it is. You can see in this photo below how the vanity is to the right and we have all of that open space to fill in with the new sink for Rick. I stood here in this position many minutes, hours, days pondering how exactly we could get the most out of the space once the big monster tub was gone. Then finally came the courage and time to follow through and get this thing out of here. We sold the tub for $200 and it was not easy getting it out. Read more about the tub and removal HERE. 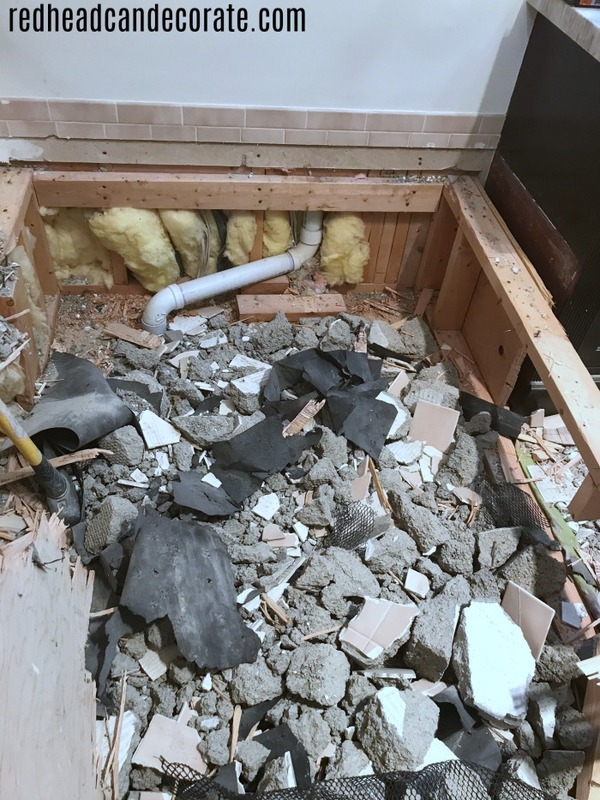 At this point below, I pretty much had a plan (you can see the bench started in the right corner), but I was so worried that splitting up the room with one side sterile white tile, and the other with the existing warm wood was a big mistake. 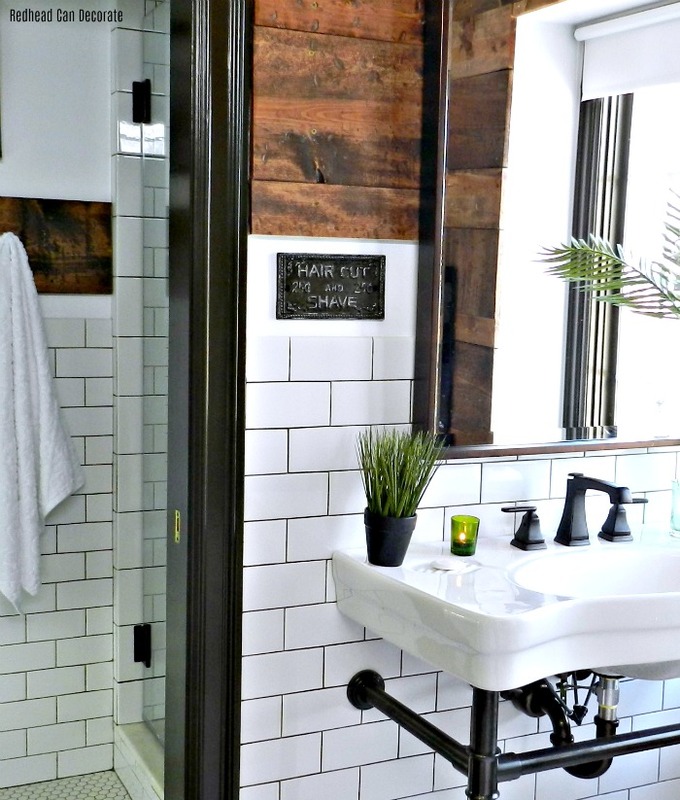 I was so worried that I would regret not taking out the existing wood floor, and I even contemplated taking out the existing vanity which was going to be mine. By the way the vanity is to the right but you can’t see it in this next photo. Well, I now know I absolutely made the right decision to keep it all. You CAN split up the room with 1/2 tile and 1/2 wood. In fact, it is genius. And it saved us not only a lot of time, but a lot of cash flow. 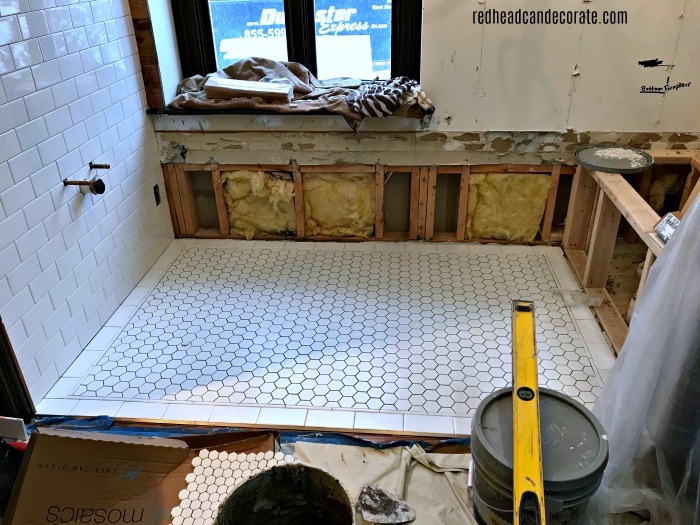 The wood floor is beautiful, and we made it work by framing the new tile with larger tiles, and we balanced it out with the wood on the walls. Where there is wood a will, there is a way. Okay, so are you ready? Beware, you might hear Rick singing in the shower when you scroll down. Honestly, I am in shock. I had NO IDEA this “shaving station” was going to look so incredibly beautiful. Talk about a nice shaving station. I mean who has a shaving station anyway? No one. Rick hit the jackpot on this one. 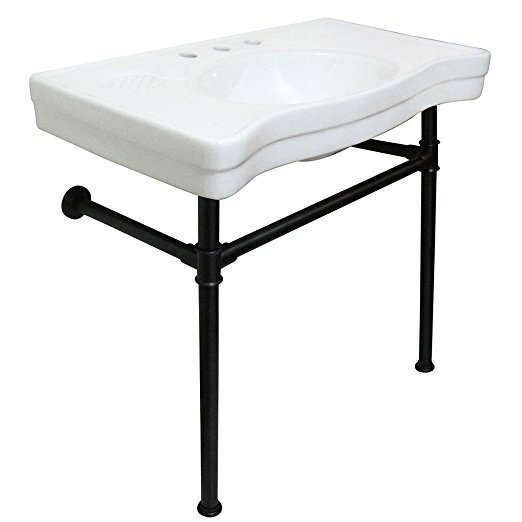 Just look at that gorgeous vintage [masculine] style sink with the large sides to rest his shaving equipment on (view source below). In real life he has a teak wood box with little compartments that sits on the window sill and it holds his shaving equipment, nail clippers, and toothbrush. Funny how I completely forgot to put it all in when I photographed this room, but the palm leaves got me side tracked . Hey, did you happen to notice our new vintage style white roller blind? Well, I can’t have anyone watching Rick shave now, can I? If you scroll up a few photos you’ll see what we had there earlier. I remember my Mom had these similar style blinds in the 1970’s in our home. This simple classic old fashioned white blind is perfecto and this version is very high quality. It also doesn’t compete with the wood, and gives a nice clean look. No curtains required. View blind source below. TIP: Fill a glass canister (not lead glass though which I found out from my friends in my private Redhead Can Decorate Home Decorating & Cooking Group-JOIN HERE) with mouth wash for a pretty splash (ha ha) of color. You’ll have fresh breath too, how about that. Rick get’s his handsome head shaved every week, so this iron shaving sign I found was a perfect fit. 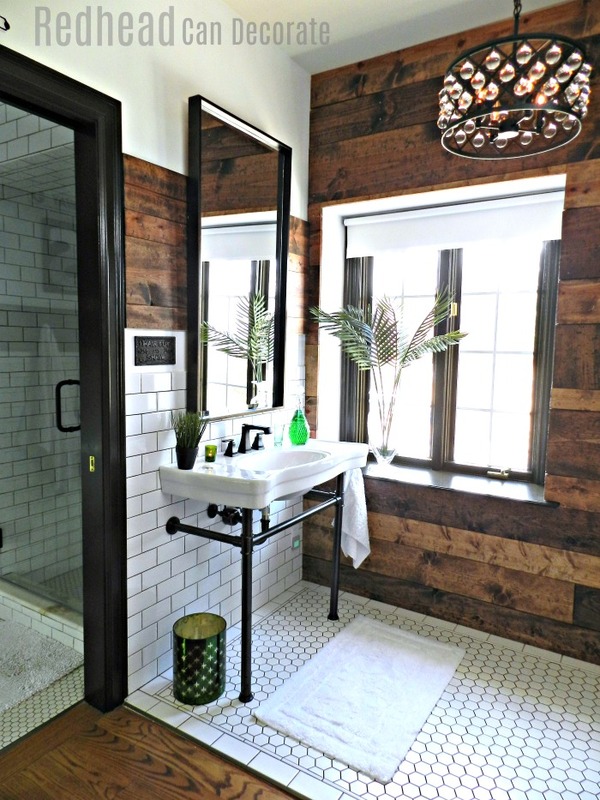 I love how the sterile white tile and warm wood mixes so well here. His entire station really gives off a rustic masculine vibe, with some soft spa-like touches with the green plants and candles. FYI-I posted more information about the wood in the “Tile Reveal” post. We carried the wood through the entire space, and have literally carried the rustic wood through out our home. It’s getting to the point where I can’t decorate without it. It just feels right. 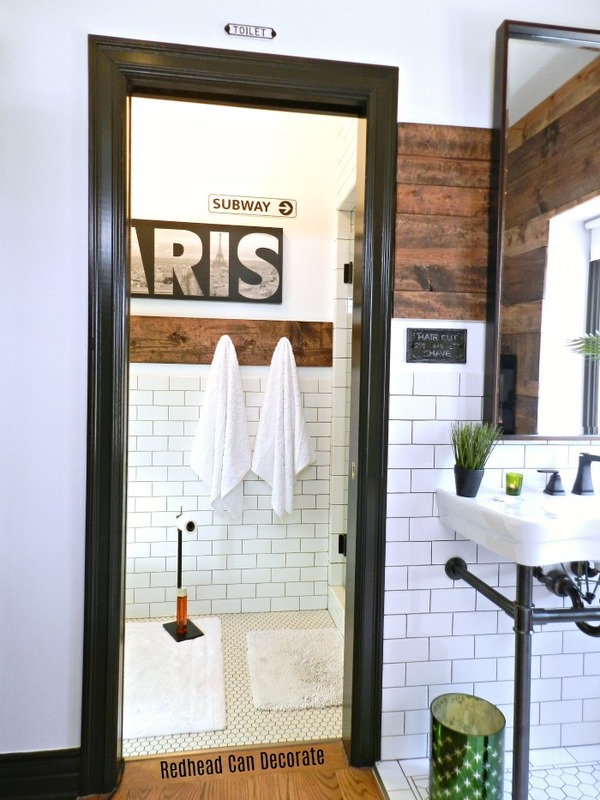 Oh, and before I forget…I added the subway sign in the shower room last week. 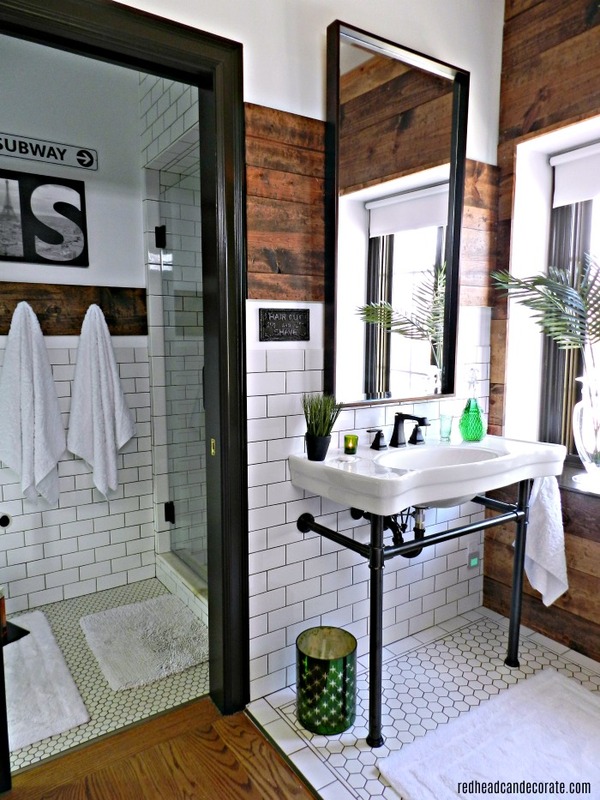 I couldn’t resist with all that subway tile. The subway in Paris is called the “Paris Metro”. I only know that because I looked it up. You may be wondering about the long rectangle mirror? Well, the mirror was actually supposed to be round. I really love the trend of big round mirrors right now. However, I came across this one for $39 bucks after a $10 coupon (view source below). I wasn’t sure it would fit, but holy moly it fit like a glove above that gorgeous sink. I take risks you guys. Sometimes they work, sometimes they don’t. If the mirror hadn’t fit, I would have carted it back to the store, no biggie. 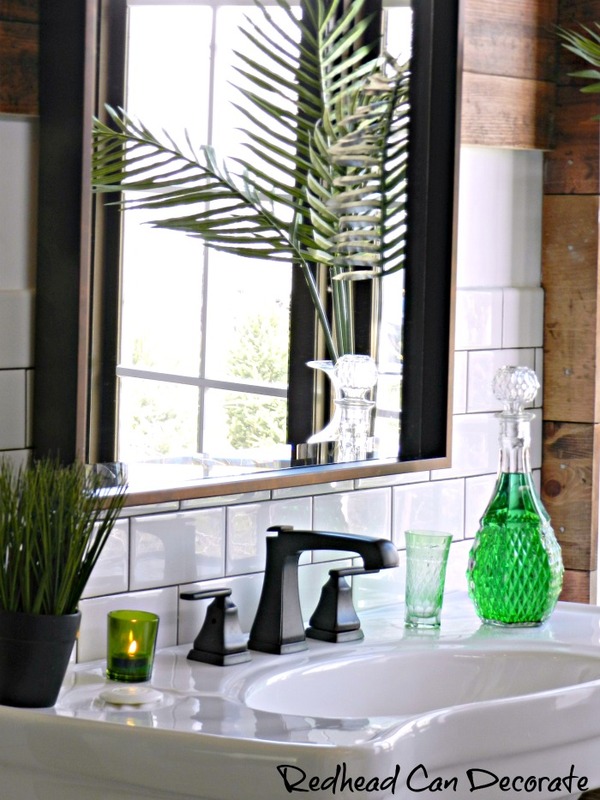 Oh, and I should tell you that when we tried the mirror and realized how cool it looked, we then had to figure out how to hang it, because if you recall we had a glass block window here before. There are no studs in the wall to hang the heavy mirror, so genius Rick thought up putting the wood across the wall first. The mirror is in fact attached to the wood. 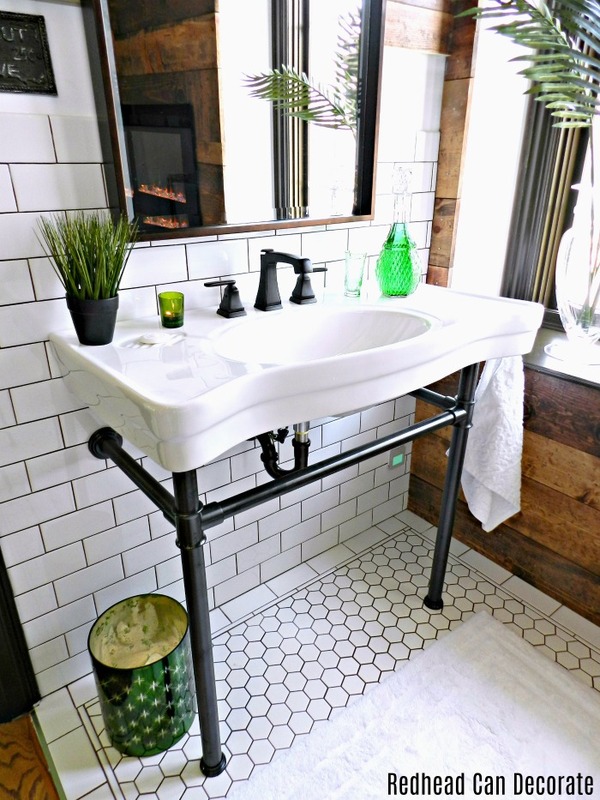 The sink is absolutely amazing (easy to clean) and we both completely recommend it. The faucet, too. Both sources are found below. I should also note that our plumber had to special order the oil rubbed bronze drain pipe below the sink because it came with a chrome colored one. I thought it was worth the wait. In the photo below you can get a sneak peek of the fireplace on the other side which will be coming up next week along with the full reveal which includes my side of the room (DIY painted vanity, DIY bench with button tufted backboard, DIY electric wall fireplace, pillows, and much more.) . Yes, it’s not all about you, Richard -ha ha. Oh, I almost forgot! The gorgeous light fixture information is below as well. I chose this one because it is feminine & masculine. 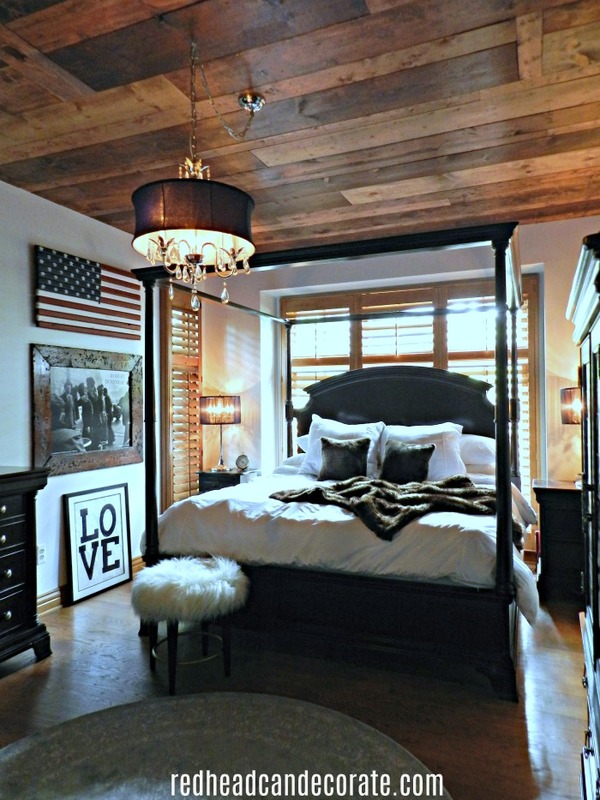 It’s rustic, yet, chic. The glass balls are so pretty and it gives off the perfect light. I’m in love with it and the price. 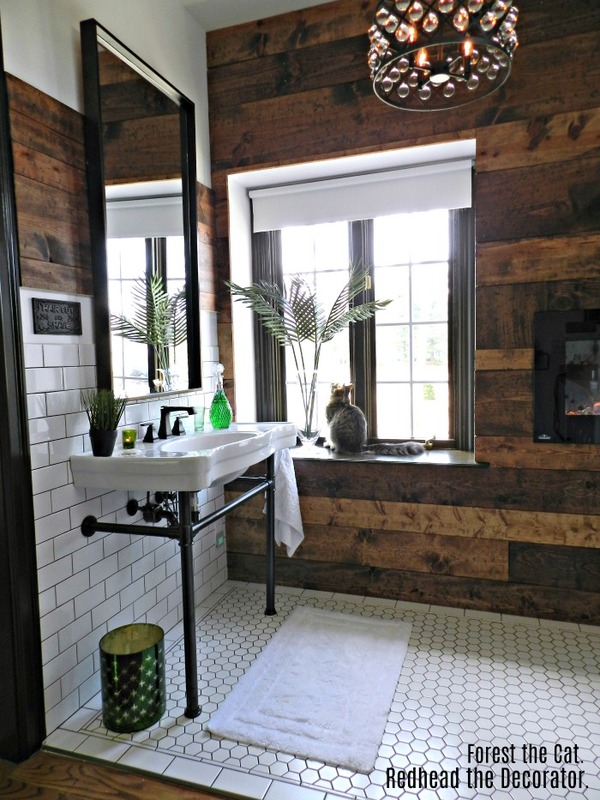 Your bathroom has turned out beautiful, love the wood And tile together. Good job! You told us about the mirror but WHERE do we buy it? There is a source list towards the end of the post. I put one in every post, and I mention that through out the article. Wish you lived nearby, so you could decorate my house. You have great taste & style. Thank you, Mari! I appreciate your kind words! Just amazing. The rooms in your house are so large, which makes for lots of updating and decorating options. I love the sink. Even my tiny bathroom could handle one of these. Thanks for the inspiration. Good morning, Pat! Removing the tub definitely gave me some extra room. Thanks for stopping by! Oh Julie, my grandother lived on Delaware Ave. in Buffalo in an elegant apartment from the 1940s until the end of her life in the 1970s.I loved her apartment and this shaving station sink reminds me so much of the sink in her bathroom, which also had similar tile. Absolutely perfect! She also had a huge stand up scale that intrigued me. I always had to try it out when I visited her. 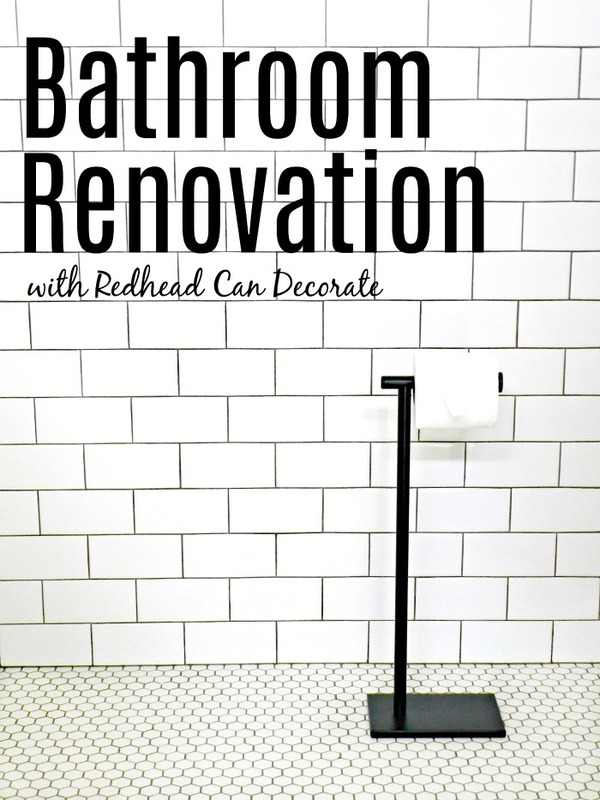 Great job on your bathroom; it’s just gorgeous! I really like the white with black accents. You guys have made your home something to be proud of. Everything you do is so ‘classy’. Have a wonderful week end. You should see me drink beer and eat nuts on our porch, Carol! Not always classy, but fun for sure my friend ? It is sealed so you just wipe it with wet cloth. Awesome! How often do you have to reseal? Hi Heather! What are you referring to? Reseal what? Hi Chris, they are actually blue and white and they are from Target many years ago. 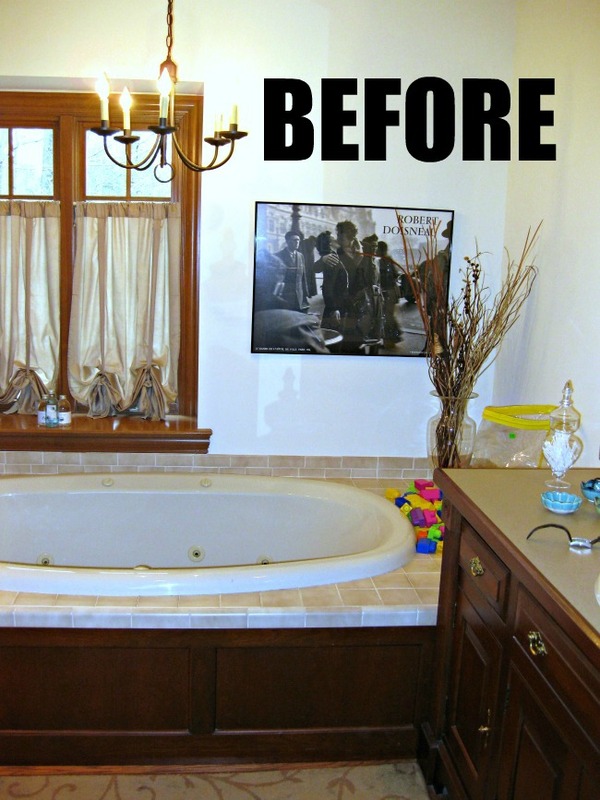 I adore your newly renovated bathroom and I love your master bedroom!! You are very talented!!! Thank you, Dawn!! I don’t always feel talented so I will take your compliment and run!! ? 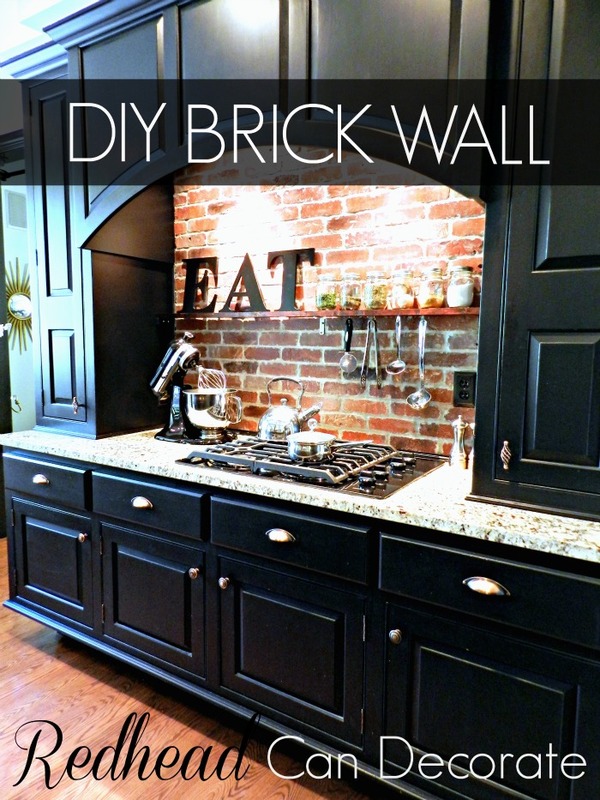 Love the look and know your hubby enjoys HIS part of the house! You keep on going, girl. Thank you, Lynda! He definitely deserves it!! ??? Your hubby is one lucky guy!! What a great start to the day! It is amazing and beautiful, just like you! Can’t wait to see YOUR side now!! !